What does HCE stand for? What does HCE mean? 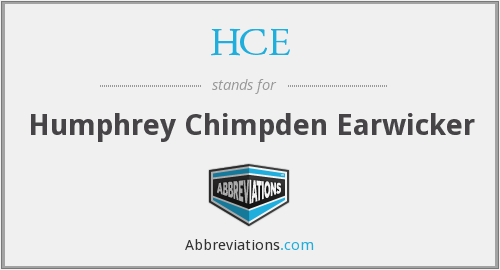 This page is about the various possible meanings of the acronym, abbreviation, shorthand or slang term: HCE. The HCE was a British four wheeled cyclecar made in 1912 and 1913 originally by H.C.E. Cars of London SW and later by the Easycar Company at a 30-acre site with test track in Harold Wood, Essex. The car used a single cylinder Buckingham engine with a tax rating of 6/8 HP driving by chain to a two speed gearbox and then by belt to the rear wheels. A range of body styles were advertised including four seaters. In 1913, and very unusual for the time, four wheel brakes were fitted. Couldn't find the full form or full meaning of HCE? Know what is HCE? Got another good explanation for HCE? Don't keep it to yourself! "HCE." Abbreviations.com. STANDS4 LLC, 2019. Web. 22 Apr. 2019. <https://www.abbreviations.com/HCE>.